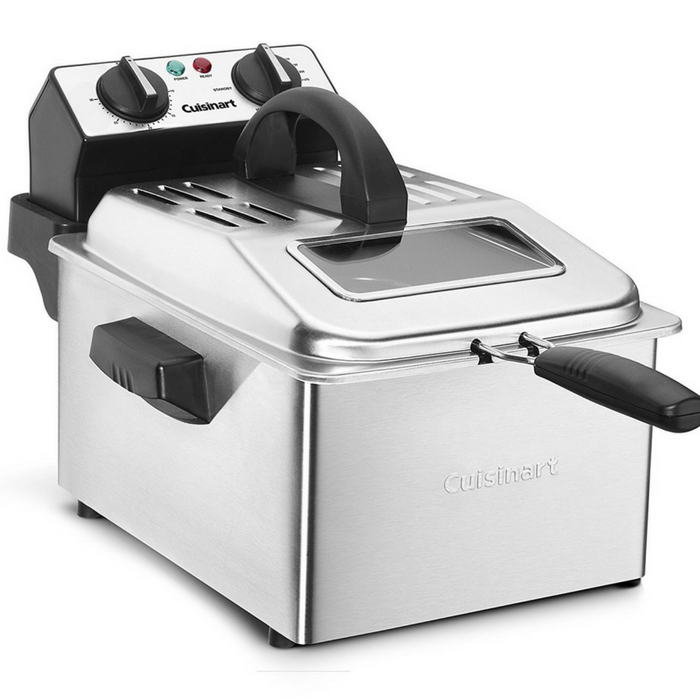 Cuisinart 4-Quart Deep Fryer Just $65.64! Down From $165! PLUS FREE Shipping! You are here: Home / Great Deals / Amazon Deals / Cuisinart 4-Quart Deep Fryer Just $65.64! Down From $165! PLUS FREE Shipping! Hurry over to Amazon where Cuisinart 4-Quart Deep Fryer is currently on sale for just $65.64 down from $165 PLUS FREE shipping! The Cuisinart 4-Quart Deep Fryer lets you serve up hot and crispy deep-fried favorites – right at home. With a powerful heating element that offers uniform high heat throughout cooking, it perfectly fries potatoes, onion rings, seafood, chicken, vegetables – even donuts. Its 4-quart large capacity can hold up to 2.3 pounds of food, making it the ideal fryer for big family meals or entertaining. When frying is done, dishwasher safe frying basket, oil container and lid make cleanup a snap.